Fishing – we do it in ponds, creeks, great rivers, the deep sea. Some fall under the spell of the chase, some spend a lifetime trying to tie the perfect fly, some just like sitting on the pier for hours. These are tales of the fishing adventures and misadventures of amateurs and pros, one-time anglers, families and friends, in the stunning landscape of Australia. 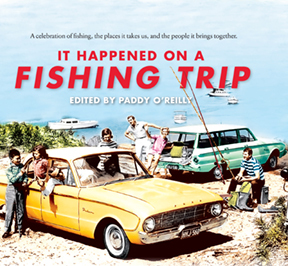 Stories, pictures and hilarious anecdotes from folk across the country, including fishing royalty Vicki Lear • Philip Weigall • Steve Starling • Greg French, writers Hilary McPhee • Krissy Kneen • Vicki Hastrich • Angela Pippos and many more amateur enthusiasts. This is the second in the It Happened series, following the hugely popular It Happened in a Holden.